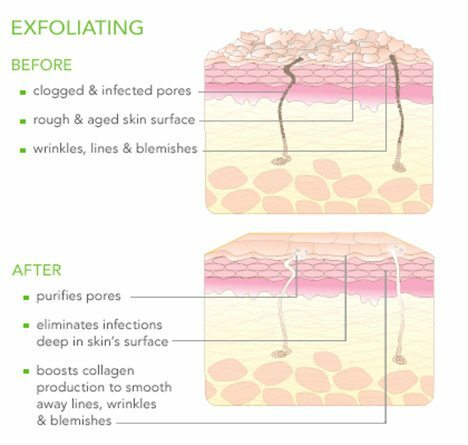 Regular cell turnover and exfoliation are important to healthy skin. With chronological aging, as well as exposure to environmental damage (including UV rays), our desquamation slows. This can lead to a buildup of dead surface cells, followed by an appearance of dull complexion, and compromised skin barrier function. Chemical peels help to accelerate exfoliation revealing even and radiant complexion. Chemoexfoliation from Glytone by Enerpeel utilizes unique acid solutions for specific skin concerns. Our advanced peel systems are characterized by a patented technology that delivers optimal outcomes reducing the usual discomfort and social downtime associated with other peels. What Can Be Expected With A Procedure? A peel procedure should take around 20 minutes depending on the type of peel you are having and the number of layers applied. During the procedure, it is possible to experience a mild tingling, itching and heating sensation. These are completely normal and are temporary. After neutralization, these symptoms should subside. Follow post-peel care regimens to experience the benefits of the peel.Every peel procedure will cause some degree of flaking or peeling with varying amounts of redness post-procedure. The degree and duration of flaking, peeling, and redness are dependent upon the acid strength and type. The day after your procedure you may start to feel skin tightness. During the next 7 to 14 days flaking and/or peeling may occur. If you do not experience any flaking or peeling, it does not mean that you will not achieve the optimal results. All peel procedures will cause sensitivity to heat and sun for several days. It is critical to the success of the peel that you comply with post-procedure care requirements. Overall, chemical peels can help to visibly improve the look and texture of your skin. Your skin may feel tighter and look more radiant. Professional peels are designed to achieve better results with each succeeding peel procedure through a series of shorter length procedures. Who is Chemical Peels For? Anyone who is looking to address facial redness, acne and visible signs of aging like lines, wrinkles and hyperpigmentation. Talk to your physician to determine which peel system is suitable for your skin type and conditions. Please be sure to follow your provider’s instructions associated with the peel procedure.